Just bought a new dog. It quacks a lot, waddles and is scared silly of pancakes and plum sauce. A Jewish neighbour popped over and said my dog was a duck. But the man at Jeremy Corbyn Dogs assured me it is a pedigree hound. And if Corbyn says the feathery quaker is a dog, it’s good enough for me. Which brings me to what else Corbyn says, chiefly that he’s not an antisemite and is, moreover, a “militant” enemy of Jew hatred. He knows what antisemitism is better than Jews. And there isn’t any in his Labour Party. Some will debate this, of course. But they cannot see that anti-Semitism is a mere distraction. Mark Serwotka, general secretary of the Public and Commercial Services Union, told a fringe event at the TUC conference that the weird accident of Corbyn finding himself stood alongside Holocaust deniers, Jew killers and Jew haters, gaining endorsements from Nick Griffin and David Duke, and his inability to notice that a massive mural he liked depicting hooked-nosed bankers sat on the backs of their myriad victims was anti-Semitic could be parts of an Israeli plot to smear the Labour leader. As Serwotka said: “One of the best forms of trying to hide from the atrocities that you are committing is to go on the offensive and actually create a story that does not exist for people on this platform, the trade union movement or, I have to say, for the leader of the Labour Party.” Not content with running the media and the banks, and embodying Nazism, those Jews are now after the moraliser-in-chief: Jeremy Corbyn. Vote Jez, then! You’d be quackers to let the bigots win! 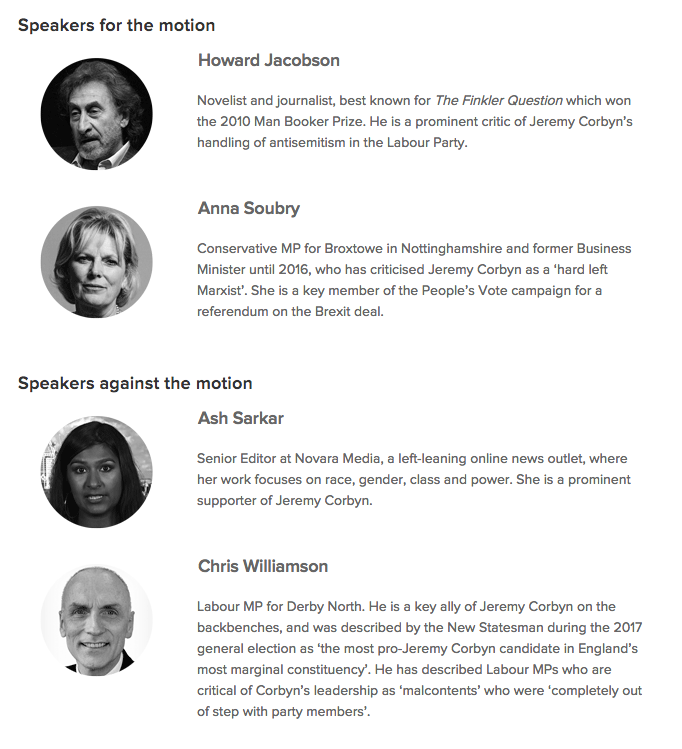 But author Howard Jacobson thinks “Jeremy Corbyn is Unfit to be Prime Minister”. This is the speech he gave to the debate organised by Intelligence Squared. Those who revere Corbyn see it as a virtue that he has never changed his views. Mr Chairman, it is only a virtue to stay faithful to one’s views if those views are worth staying faithful to. Or maybe you’re going to vote for Corbyn, reason that Jew hatred is no big deal. Really..? You’re going to do that?